Creative sent us two of their top tier SoundBlaster products including a Bluetooth speaker as well as a gaming headset. Today we’re reviewing the first product in line, the sound blaster roar 2. To be honest, I’ve been a huge fan of these Bluetooth speakers since I bought the first Roar edition 2 years ago. Never had a Bluetooth speaker before, but for the first time I was astounded by the quality of this speaker. I thought it was impossible to contain so much audio power in a small package. Even a good amount of bass was present and could be amplified with just one button! In the meantime I've been reviewing comparable products who managed to build similar audio solutions which makes it even more interesting to see what the Roar 2 can do. Today, Creative released some new additions to the Roar line, whereas the Roar 2 is the successor of the first Roar product. Being as powerful as the previous Roar, Creative made some changes in the design of the speaker. What Creative achieved some years ago was already impressive, but they wanted to go even smaller without losing any of the audio power output of the speaker. They managed to fit as much power as the first Roar in a 20% smaller package, making the Roar 2 a product using the full potential of its size. The Roar 2 is also slightly lighter, but still weighs quite a bit which makes it more vulnerable when dropped to the ground. Basically, both designs are similar to eachother, but we see some refinements resulting in a more sleek and modern design. On the sides, the Roar 2 offers two very neatly finished passive radiators which are a charm to see in action. Amp-design hasn't changed, still using a bi-amplified (two amplifier) design which dedicates an individual amp for both the high and low frequencies. Most other speakers use a single amp design causing audio distortion when both lows and highs are played on higher volumes. The internal design of the original Roar used to have two front facing 1.5" Mylar high frequency drivers, a 2.5" upward facing Bass-Midrange driver and two passive radiators on the sides. To save space and keep the same roomfilling audio output, Creative chose to face both front facing high frequency drivers upwards. A well balanced shape of the Roar 2 makes is very suited to play on higher volumes without shaking. Creative informed us that some functions have been left behind to reduce production cost including the alarm function which was basically useless.. The buttons for Roar and TeraBass are now used as one button and can be enabled seperately by pushing once or twice. Packaging is done well and shows some ressamblence with the packaging we've seen with the original Roar. A quality product with this price tag should have a solid packaging with a decent set of manuals and accessoires. The interior is properly structured like we expected it to be. There are also 2 different plug heads to give you the ability to easily charge your speaker on holiday. Also a USB to microUSB is included into the package. It's a pity they didn't include a mini-jack. Creative made the right design choices and gave the Roar 2 a much sleeker look than the original, while giving two color options: white and black. Our Black edition of the SoundBlaster Roar 2 was very nice to look at. While the Roar 2 retains the sturdy-feeling design from the original Roar, it has been given a more attractive and laid out exterior. The Roar 2 might be a little more fragile than the original due to the half-exposed radiators (which are awesome to see in action, so I'm not opposing this idea). However there was also a rubberized controlpanel runnen all the way to the bottom of the speaker which made that it could absorb a shock. The new Roar 2 doesn't have this 'shock absorber'. While the Roar 2 is lighter (and thus less vulnurable to drops), it still isn't much lighter than the original. That said, both points are minor details as we're still speaking of a very firmly designed exterior. Looks-wise, the Roar 2 is greatly improved relative to the original Roar. 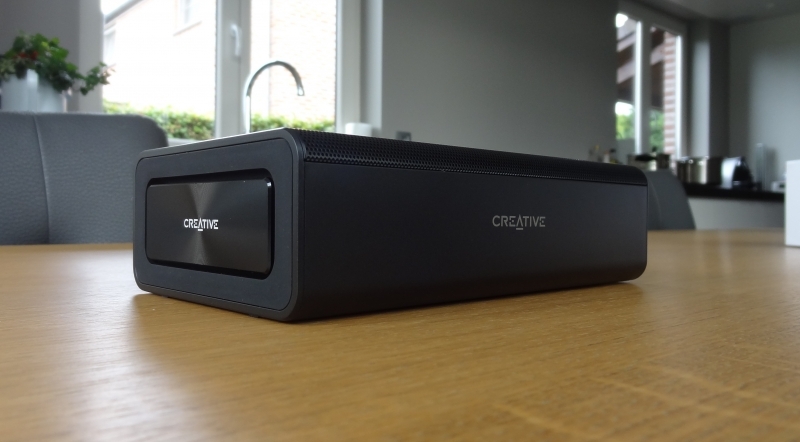 Creative's SoundBlaster Roar products are accentuated by their most significant feature, the 'Roar' boosting feature. Accompanied by the TeraBass feature, they tend to reach out a wider public with different tastes of music. While the TeraBass feature "intelligently makes up for the perceived loss of bass during low volume playback without artificially over-accentuating bass levels", the Roar button is purely meant to boost loudness and provide a more spacious and warm sound. The performance of the speaker is pretty similar to what we've seen with the original. Due to the bi-amplified design, one driving the mids and lows and one for the high frequencies, there's much more accuracy and depth in lower mids and vocals stay loud and clear. Highs do not sound too harsh like we're used to hear in somewhat cheaper bluetooth speakers with a single amp design. While the Roar 2 sounds impressive on a low-volume using the TeraBass option, it only gets better when turning the volume up a notch. No distortion and the bass isn't notably limited by digital signal processing. This bluetooth speaker is suitable for outdoors and slightly larger rooms. It's wonderful how the small speaker can keep up with the KEF muo and JBL Xtreme while selling on a much lower price point. The Roar 2 is only slightly less loud than those two. For the Battery, it offers the same 8-hour battery life that the original model did, this is slightly less than the KEF Muo or JBL Xtreme, but given the speaker's size, that's still quite reasonable. One thing I'm not too happy about is the fact that the maximum volume reduces when the battery level decreases. For this there are 3 states, when 3 leds are burning you can play the maximum audio output until there're only 2 lights left. We spoke about this and it's purely a choice of the makers from the Roar 2. They believe that this allows the user to play music for a longer time. The battery life is not the greatest we've seen on bluetooth speakers, but is still decent especially for the price-tag and audio quality you get in return. In addition to this, you can also use the speaker as a power bank to charge your mobile devices. The conclusion was easy to write down. Creative's Roar 2 is everything what we expected it to be. After such a good time with the first Roar, we were already convinced of creative's excellence in audio solutions. The audio quality is slightly improved while the bi-amplified design is being stuffed inside a smaller device with a much more attractive exterior. Accompagnied by an army of features, a decent battery, awesome-looking half-exposed radiators and a powerful and accurate audio output; there's not one bluetooth speaker that can say the same in this price category. Creative as a company is managed by engineers and that's what we can see in how much value is presented to the customer. We decided to give the Creative SoundBlaster Roar 2 a Gold award!